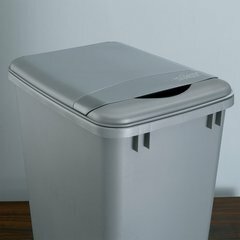 Waste containers need not be an eyesore. Update your space with the contemporary 5149 Series. 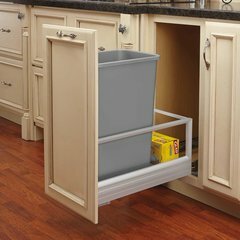 Minimum Cabinet Opening Height : 24"
Minimum Cabinet Opening Width : 11-1/2"
Waste containers need not be an eyesore. Update your space with the 5149 Single or Double Door Mount Waste Containers-featuring a sleek anodized aluminum frame that glides effortlessly on soft-close slides.The coordintaing silver polymer base and bins come in a variety of sizes depending on your disposal needs. For trouble-free installation, the included door mount brackets allow of to 5" of flexibility to fit any door style. 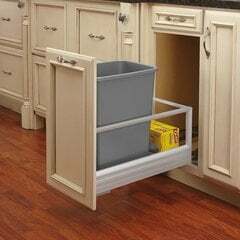 Purchased this for under the sink and it comes with easy directions and attachments. I had a very small window for height and depth. This slide fit the bill and I had no problems with installation. My assumption was that is made for an RV but the advertised photo suggested otherwise. Who cares? It is made well and works like a charm.